In the 15 or so years since Whit Stillman wrote and directed a movie I have either A) grown too old and cynical B) he has lost his knack for writing smart, ironic dialogue or C) he thinks Millennials are too dumb to speak as smart as Gen Xers. His return to the big screen, Damsels in Distress, has its moments but does not feel as sure-footed as his earlier films, like Metropolitan (1990) and Barcelona (1994). The film opens with Violet, Heather and Rose (Greta Gerwig, Carrie MacLemore and Megalyn Echikunwoke) picking out new friend Lily (Analeigh Tipton) from a batch of transfer students to their college, Seven Oaks. Though one might assume this is Stillman’s take on Mean Girls or Heathers, it soon becomes apparent these women only act out of an honest sincerity. The preppy East Coast college where most of the action unfolds seems to exist in some alternate universe where the average IQ of humanity lands a few notches lower than that of the movie’s audience. There is simply no room in these kids’ brains for hidden agendas. Seven Oaks is a privileged school where most students look like something out of a J. Crew or Ralph Lauren ad, yet some are too ignorant to know the colors of the rainbow. Still, there is a dark side to Seven Oaks. The school seems to have a high suicide rate among its students. The education department in particular seems notorious for suicide attempts. Thankfully, those majoring in education seem too dumb to realize a leap from the top of a two-story building only leaves them maimed. Enter Violet and her friends who run the Suicide Prevention Center. Their therapy? Tap dancing. The three girls only want to help their peers. They attend frat parties to intervene and keep frat boys happy by talking and dancing with them. This is a world far removed from Stillman’s earlier films of privileged, naïve people who at least offered eloquent thoughts on the difficulty of maneuvering through social constructs. Some either rebelled against them or tried to squeeze into them. In Damsels we have only one questioning soul in the form of Lily, who seems to just go with the flow. Early in the film, Lily seems to short-circuit Heather’s brain after Lily explains to her new friends that her ex-boyfriend Xavier (Hugo Becker) spells his name with an X and not a Z. “That’s impossible,” huffs Heather, arguing that the only way it could be spelled is with a Z because of the mark Zorro left in the movies. Lily tries to argue her side, but Violet steps in and humors Heather’s argument by making up the existence of a rival, less popularly known Xorro who left his mark with an X. When that seems to calm Heather, Lily accepts it. Stillman maintains his skills for the witty dialogue that made him an exciting voice in the nineties era of American indie film, but it lacks the robust meatiness of those earlier films. If this is social commentary, the degree to which the friends accommodate ignorance is frightening and superficial. This condescending perspective feels a bit of a cop-out for Stillman. There is no real resolution in the end or lesson learned, much less transcendence (unless you consider a dance number that explains the Sambola transcendental). In fact, Stillman ends the film with a few footnotes refuting some of the falsehoods these characters take to heart. In the world of Damsels, ignorance is bliss and bliss can only be found through the false safety of ignorance. *Underneath that, the notion that jiff is short for jiffy may just be lost among these characters. Ironically, the word’s origin is listed as unknown, according to Miriam Webster’s dictionary. Maybe Stillman is skewering the ignorance of society in general? 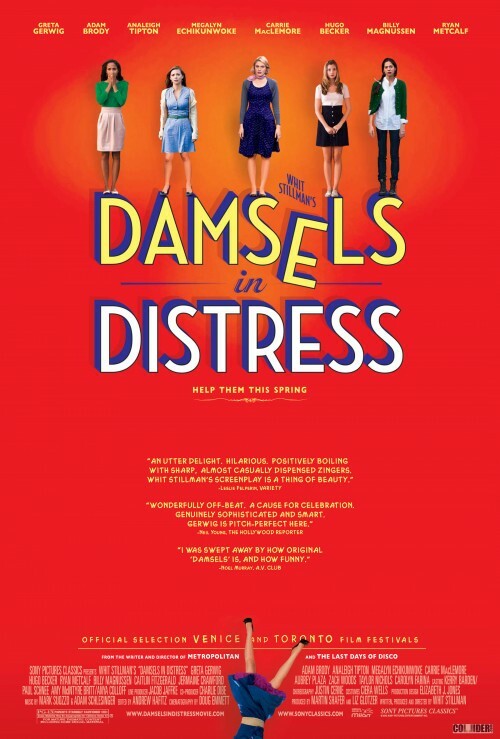 Damsels In Distress is rated PG-13 and runs 99 minutes. Though it has already opened in select theaters in the US, the film now finally opens in select South Florida theaters on April 27, including the Regal South Beach in Miami Beach, the Gateway in Fort Lauderdale, the Regal Delray 18 in Delray Beach, the Regal Shadowood in Boca Raton and the Sunrise 11 in Sunrise. Update: Damsels will also play at the Cinema Paradiso in Fort Lauderdale on June 27 (tickets).